Khartoum — Dr Amin Mekki Madani, a prominent Sudanese human rights defender and head of the Sudan Civil Society Initiative, passed away today. Madani was one of the civil society leaders who wrote critical letters to the AU high-level Implementation Panel (AUHIP) ahead of meetings in Addis Ababa that discussed alternatives for a solution to Sudan's multiple crises. The civil society leader was kept in detention by the Sudanese authorities for months in 2015 after joining the Sudan Appeal, a political communiqué calling for regime-change. 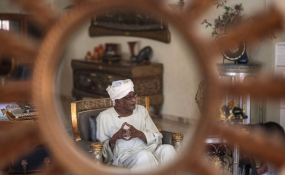 He was released together with two other prominent opposition figures, Faroug Abu Eisa (Sudan Democracy First Group) and Farah El Agar, on April 9. Opposition and civil society groups criticised the long detentions of the men they considered "symbols of the Sudanese opposition". Movements for human rights in Sudan and worldwide had advocated for their release. Madani was also barred from travelling to Egypt at the airport in Khartoum in January this year. Days later agents of the National Intelligence and Security Service (NISS) prevented seven other prominent opposition leaders from travelling to the French capital for meetings with the Sudan Appeal opposition. "Amin never bargained for what he believed in." Condolences to Madani's family by the Sudan Democracy First Group (SDFG) spoke of "one of Sudan's greatest heroes through his tremendous stuggles in his public work, where he was as faithful to his nation's people; in his legal profession and professional conscience. In defending the rights and liberties of the Sudanese people, Dr Amin was subjected to many acts of oppression, detention, persecution and harassment. He was incarcerated as a young and old man and in good and bad health, but he never bargained for what he believed in." During his career, Dr Amin assumed many tasks, most notably as the Chairman of Board of Trustees of the Arab Organisation for Human Rights, and as the President of the Sudanese Observatory for Human Rights. He also held several positions in the United Nations, especially in crisis areas and played a role in the establishment and chairmanship of the field office of the Office of the Commissioner for Human Rights in the occupied Palestinian territory in 1996. And until today Dr Amin Maki Madani has been the President of the Sudanese Civil Society Intiative since its establishment in December 2014. "The great late Dr Amin has left us during a time where darkness looms over the Sudan, a time during which his fellow country's men and women, young and old need him more than ever. Throughout his life, he has never ceased to effortlessly bless us with his wisdom and knowledge," SDFG concludes its statement.